The 100-year old terrazzo floor in The Sisters Of The Holy Redeemer Church was badly scratched, worn, and pitted due to decades of improper care and heavy foot traffic. The caretaker for the historic Huntingdon Valley facility in Montgomery County, Pennsylvania, decided after a FREE consultation and estimate on the 3000 square foot floor to hire us for this important job. We aggressively sanded the floor to remove all the soiling on the terrazzo flooring, as well as the topical coatings that had been applied throughout the years. We filled and repaired about 50 holes where rows of pews had been removed and then honed and polished the entire floor to restore the finish. Our final step was to apply a penetrating sealer to inhibit staining. As you can see in the AFTER image, the repair sites are seamlessly matched to the surrounding areas and the floor has a like-new appearance. To learn more, visit our Terrazzo Services page and watch these videos: Restoration of Natural Stone and Terrazzo, Terrazzo Restoration. 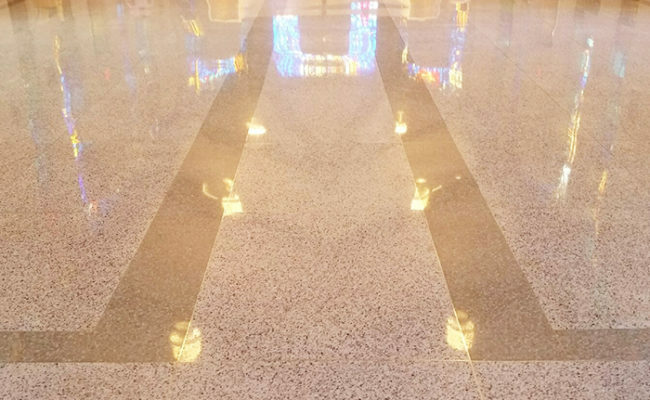 Do you need terrazzo floor polishing services in the Philadelphia or Delaware Valley area? Use our online contact form or call (610) 356-4100 today for a FREE estimate.